I recently attended the BCUG/NAVUG Summit 2018 show in Phoenix with a client who was a Gold Level Sponsor. It was the first trade show of this size either of us had attended as sponsors, and I learned a lot – including how to stand out in a room of 100 other companies and how to network with partners. Among my learning, I made a ‘stop, improve, keep’ list of items to help us improve our marketing strategy and make the most of our sponsorship in upcoming years. If you have a trade show or conference coming up, use this list to help you prepare! Getting distracted by conversations amongst ourselves and forgetting why we’re standing in the booth. Never turn your back on the aisle. A member of the team should always be greeting people passing by. Doing the bare minimum, which, at a trade show, is a greeting, quick elevator pitch, hand out your brochure, and send people on their way. Think of ways to go above and beyond this simple interaction. Getting bummed out in the beginning. The first days are always the longest. Attendees and sponsors are busy figuring out the lay of the land, their competition, and who they want to talk to. Don’t be discouraged if your first day doesn’t meet expectations. Booth layout. 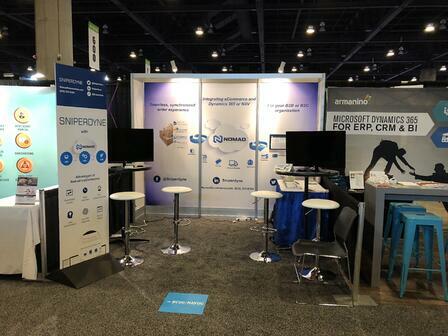 To avoid doing the bare minimum and improve our experience next year, we decided to get a larger booth. 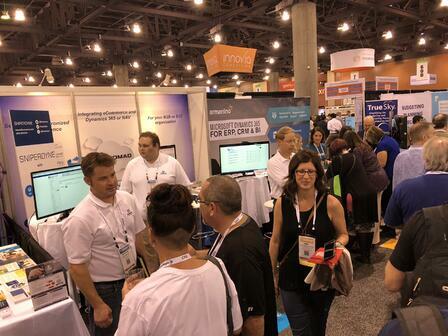 Small booths are easier to set up and more affordable, but they get crowded … fast! A hook gets people’s attention and makes them want to talk to a staff member at your booth. Some of the most well-attended booths at BCUG/NAVUG Summit had interactive elements; something as simple as a basketball hoop is memorable and draws attention to bring a crowd. We needed food or drinks to give away. People are driven by their senses; if you can draw them in by sight (with your booth) AND taste and smell, you have a winning combination. A prize drawing or contest. One of the biggest pulls for our booth was to enter our contest to win a $200 Amazon gift card. A contest/prize drawing makes people want to stop by and drop off a business card, which is a great way to get leads. Time to meet with other sponsors. Not all the other sponsors will be competitors, so meet with them to see who you can learn from, partner with, and network with. Have fun! Make the most of these events, especially if you’re in a new city. Meet with other companies and partners for dinner or attend a sponsored after party. There are plenty of chances to continue work-related brainstorming and networking after show hours. After the event is over and everyone gets back to their office, it’s easy to forget to follow up, but that’s the key to a successful trade show/conference. Don’t leave it up to attendees to follow up with you! Questions about trade shows or conferences? We can help – contact us!